The thyroid produces two hormones called thyroxine and triiodothyronine, better known as T3 and T4. These hormones control our metabolism and are responsible, among others, for our caloric expenditure, body temperature, for our weight gain, etc. The pituitary gland or pituitary gland is an organ that is located at the base of the brain and controls the degree of thyroid function through a hormone called TSH (Thyroid Stimulating Hormone). The presence of blood TSH stimulates the thyroid functioning; lack of TSH inhibits it. When there is little circulating of thyroid hormone, the pituitary detects this drop and immediately increases TSH secretion, stimulating greater production of T3 and T4 by the thyroid. When there is too much circulating of the hormone, it decreases the secretion of TSH, discouraging the thyroid to produce T3 and T4. Thus, the body can always keep your metabolism at an optimum level. 1 - A problem in the pituitary causing uncontrolled production of TSH, which in turn stimulates the thyroid to produce T4 and T3 indefinitely. When the cause of hyperthyroidism is central, that is, one pituitary poorly functioning we will have a very high TSH also associated with a very high T4. 2 - The thyroid becomes an independent body to produce T3 and T4 at their pleasure, ignoring the blood levels of TSH. When the problem is in the thyroid itself, the first thing our body does when the pituitary detects high levels of hormones is suspending production of TSH. So we have a very low TSH, but still a very high T4. Note: in clinical practice there is free T4 (FT4) which is the fraction of chemically active hormone. Regardless of the cause, the symptoms of hyperthyroidism are always caused by excessive circulating of FT4, which is a common consequence, either by itself or in central problem thyroid. 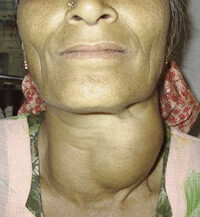 The goiter, last sign described above, occurs when there is increase in size of the thyroid gland. This growth is common when there is a constant stimulus for production of T3 and T4, which can be noticed clinically as a bulge in the neck. The most common cause of hyperthyroidism is Graves' disease. This disease is an autoimmune process when the body starts producing antibodies inappropriately against their thyroid. These antibodies attack TSH receptors, causing the thyroid think there is too much TSH in the bloodstream. The end result is an excessive release of thyroid hormones. A serious disease is 8 times more common in women and usually occurs at the age between 20 and 40 years old. In addition to all the signs and symptoms described above, by Graves' hyperthyroidism may present the so called Graves' ophthalmopathy. The antibodies attack not only the thyroid, but also the muscles and fatty tissue in the area around the eyes. This aggression causes injury and edema of the extraocular muscles, leading to a protrusion of the eye, besides swelling and inflammation around it (periorbital edema). The patient with Graves' ophthalmopathy may also have double vision, constant eye irritation, eye pain, blurred vision and, in severe cases, blindness. 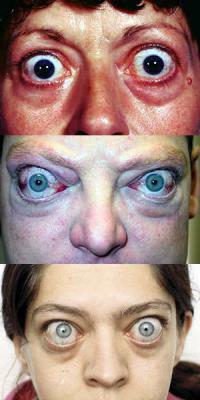 Some people naturally have more protuberant eyes. Moreover, the very excess of thyroid hormones can lead to shrinkage of the eyelid. However, in Graves' ophthalmopathy the protrusion is so important that you can see the whites of the eyes (sclera), above and below the iris, as exemplified below. A rare manifestation of Graves' disease is the dermopathy, called myxedema, which occurs by infiltration of the skin by autoantibodies. The skin is swollen, hard, with nodules on its surface and more darkened. Plummer's disease or toxic multinodular goiter: the formation of adenomas, benign tumors in the thyroid. These adenomas are chemically active and produce T4 and T3 thyroid independently as well as circulating of TSH. Toxic Adenoma: the same situation as above, except that there is only one solitary adenoma producing excess hormones. Thyroiditis: inflammation occurs by the thyroid. 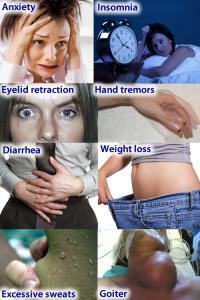 It may be due to viral infections, autoimmune causes other than Graves' disease, postpartum etc. Excess thyroid hormone: patients with hypothyroidism who make excessive replacement of hormones may provide a framework for hyperthyroidism. In this case simply correcting the dose for symptoms to disappear is needed. TSH-secreting adenomas: less than 1% of cases of hyperthyroidism occur due to inappropriate TSH secretion. The main causes are pituitary adenomas. Although they are benign tumors, their growth can compress brain structures and cause neurological and vision loss. There are three different modalities of treatment for hyperthyroidism: drugs, radiation or surgery. The choice of the most appropriate is made individually for every patient due to some data such as age, severity and cause of hyperthyroidism. 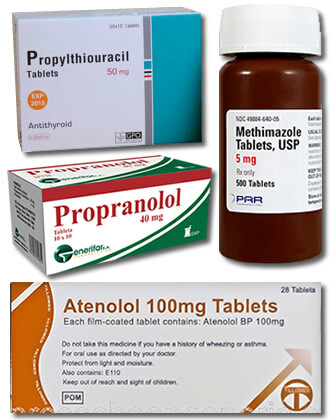 The two main drugs used in the treatment of hyperthyroidism are propylthiouracil and methimazole. Both act by preventing the production of hormones by the thyroid. Its effect takes on average three weeks since these drugs only prevent the synthesis of new hormones, having no effect on those already produced and circulating. 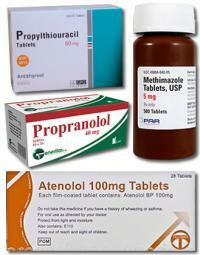 For a quick control of symptoms, beta-blocking drugs such as propranolol or atenolol may be used. About 30% of patients can, after 2 years, definitely stop medication without presenting return of hyperthyroidism. However, most of these drugs remain dependent. Because side effects are common and sometimes serious, other therapeutic modalities are needed. The destruction of the thyroid by radiation is a definitive treatment option for hyperthyroidism. Treatment consists of ingesting capsules with radioactive iodine. As the thyroid uses iodine feed to produce T3 and T4, it starts to focus all radiation ingested, the same being destroyed over 6 to 18 weeks. The radiation of this treatment is very small and practically restricted to thyroid, not being able to cause cancer elsewhere in the body. However, distance from pregnant women is recommended during the first 7 days of treatment, since there is always a chance of exposure to radiation. Surgery to remove the thyroid is the 3rd treatment option. It is the least used due to the risk of postoperative complications. It may be indicated when the thyroid is greatly enlarged, with great risk of goiter and airway obstruction. Both surgery and radioactive iodine cure hyperthyroidism, but destroy the thyroid, leading to hypothyroidism. Therefore, replacement with T4 is indicated.